As a marketer, you need a stress-free way of qualifying future customers by quickly asking for more information within the same form. 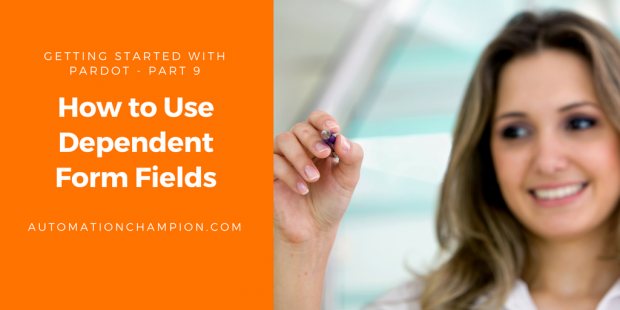 With dependent form fields, you can easily ask further qualifying questions based on previous answers. For example, if a prospect belongs to the country United States then you can ask State or Company. Until now, we created a form (If you missed the blog post then refer to this) and implemented Progressive profiling in Pardot hosted form. In this blog, I will go one step further and show you why we should, and how we can, add a dependent field on a Pardot form. Company field is of not much help to GurukulOnCloud – to qualify prospects – if the value in the Country field is anything other than United States or Canada. As a result, GurukulOnCloud is looking for a way to make the Company – a ‘Dependent’ – field based on the value populated in the Country – a ‘Controlling’ – field. So, only if the value in the Country field is United States or Canada, then display Company field; or else, do not display Company field at all. If you want to display only country codes then select Country Codes for dropdown Prefill With drop-down field. It is also possible to show US States or US States Codes etc. The next step is to make Company field dependent based on Country. To do so, navigate to Dependent tab and select Display other fields in this form based on the value of this field checkbox. When finished, click on the Confirm & Save button to save your form. There may be some fields in which you may always want to make sure that the data populated in the fields is up to date. For Example, Phone field. If you always want to display such fields on a form then select, Always display even if previously completed checkbox, available under the Advanced tab. Use Do not prefill (refer preceding screenshot) checkbox for fields such as comments where the prospects may want to submit a value more than once (and you would not want to display their previous response). Use Maintain the initial value upon subsequent form submissions checkbox to retains the initial field value even if the prospect has submitted additional forms with other values for the same field. In my next blog, I will take a deeper dive by showing you how to create your first automation rule in Pardot.